You are here: Home / Age of the Earth / Covered in Shells: How many fossils are there? Covered in Shells: How many fossils are there? SUMMARY: Below I calculate the number of fossils in the Midwest region from some of my own observations and knowledge of the area. I conclude that at a minimum there are enough fossils in just this one set of rock strata in the Midwest US to cover the entire earth with 20 small shells (little smaller than a dime) per square foot. Considering other factors it is clear that there are simply too many shells in the fossil record to be explained as having lived during only a brief period of time before a global flood. I am convinced that the presence of these fossils, the types of fossils, and the positions they are found presents a clear and difficult challenge to scientific creationists who feel them must explain all these fossils as having resulted from a global flood. As a result, it is not surprising that other Biblically consistent interpretations of these fossils has been sought out by Christians trying to make sense of Scripture and general revelation. If my observations are correct, for Flood Geology to explain the presence of such fossils would necessitate an appeal to miraculous creation of such fossils by God at some point. As a result the person who seeks answers to why such numerous fossils are present in the fossil record is left with only three possible explanations: 1) God created almost all strata including fossil-bearing strata during the Creation week, 2) God supernaturally created and placed the fossils in the rock at some point after the Creation week, most likely during the flood, or 3) the earth is much older than 10,000 years and the strata containing these fossils was derived as the result of long periods of soil and shell depositions. When I travel I frequently stop by the side of the road and look for fossils at rock outcrops. Here are some of the places (just in the Midwest) I have personally observed significant quantities of fossils in the last couple of years: Kentucky: Interstate 65 between Bowling Green and Louisville in several road cuts leading down to rivers, Interstate 71 just outside of Louisville on the way to Cincinnati, Interstate 75 at a road cut leading down to Ohio River at Cincinnati, Interstate 275 at a road cut leading down to Ohio River, Interstate 64 just inside Kentucky from West Virginia, Interstate 64 near Olive Hill (half way from Huntington WV to Lexington, SR7 at road cut (Madison IN)leading to Ohio River halfway between Louisville and Cincinnati. I also saw many fossils in West Virginia and Ohio but not from the same rock formation as the Kentucky ones. The message here is that it is not hard to find fossils anywhere in Kentucky, southern Ohio and Indiana, although most aren’t very exciting. At the locations I have listed one can get out of the car pick up a rock and often the rock will consist of more that 50% fossils (or even 90% or greater fossilized material) usually bivalve shells, crinoids and pieces of coral. At each of these sites there are several layers of rock that are almost entirely made up of fossilized shells about the size of a dime. 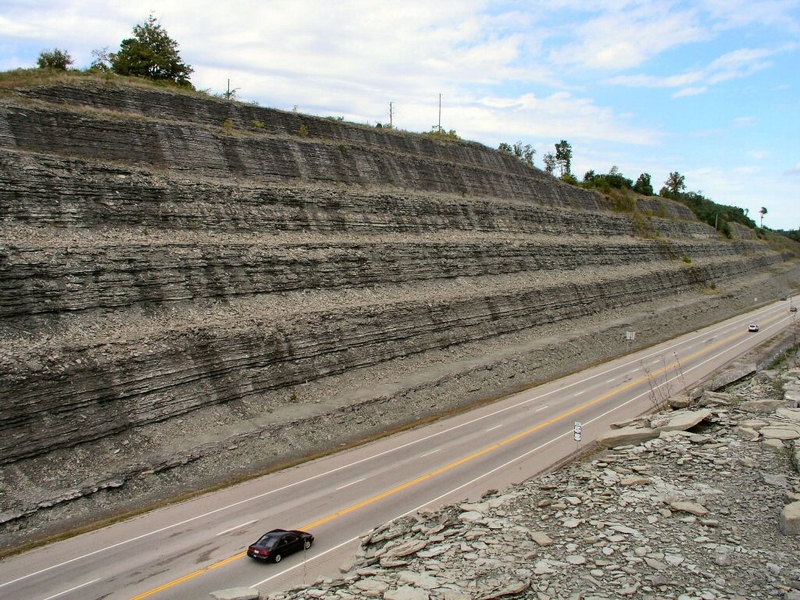 Interstate 64 Near West Virginia there were at least three visible layers of rock each more than 1 foot thick that were solid shells each separated by a layer of sandstone a couple of inches thick with no visible fossils. All the sites had a minimum of three solid feet of rock that was almost nothing but fossil shells (not necessarily three contiguous feet of rock but several layers of fossils amounting to at least three feet). The SR 7 site is every impressive. A couple of years ago I stopped along this site and looked up and down the rock wall as the road goes on the way to the Ohio River. Over 350 feet are exposed in which at a minimum 100 feet of it is packed full of fossils shells (50% shells or greater). The other layers also contain large numbers of shells as well although there are a few seams of sandstone several inches to several feet thick that contain few to no apparent macrofossils. After crossing the river one could go up through a road that has been cut right into the rock for at least 300 feet (I am trying to be extremely conservative in my estimate of height since I don’t have a geological map right in front of me, I think 400-500 feet is more likely). A similar pattern of fossil layers is present and this is at least 4 miles away from the other road cut. At Cincinnati almost the same thing occurs. I don’t want to belabor the point with too many details but I want to make it clear that over a very wide geographical area are found layers of rock that contain huge numbers of fossil shells in the Midwest. The ABSOLUTE minimum number of fossils in the rocks that make up this commonly found rock formation, would be equivalent to 3 solid feet of shells. I saw at least this many at all the sites I was at. In fact, at most sites if all the shells were taken out and piled up I am sure it would amount to 10-50 feet in some areas. Even more dramatically, this was just from what I could see with my eyes and doesn’t include the many thousands of feet of rock strata that lay below me and were not exposed. Fossils in rocks from a road cut near Cincinnati OH. In addition to my personal observations, we know from rock cores taken for the purpose of oil exploration that the same calcareous rock (made up of fossilized shells and crinoids) is found over a huge area covering the entire Midwest region. Just considering the best known fossil areas I can safely say this includes an area covering 500 (West Virginia to eastern Missouri) by 300 miles (southern Kentucky to middle Indiana/Ohio) in which there are layers of rock that contain at least 3 feet of fossil shells mixed with some crinoids (again, I am being very conservative in my estimation here). Given this information we can do some simple calculations. Now take the number of fossils in three cubic feet and multiply by the total number of square feet that these fossils are covering (remember I am using a bare bones minimum for both the thickness and number of fossils in the rock at any one place in this entire area). 36000 fossils X 4.8x10_12 = 1.73x10_17 (or 230,400,000,000,000,000 fossils shells a little smaller than a dime) or two hundred and thirty thousand trillion. To spread all of our fossils over the entire surface of the earth we would divide the number of fossils by the total area: 1.73x10_17 fossils / 1.13x10_16 square feet = 15.3 shells per square foot. 2) In addition, most organisms that produced these shells likely could only live in shallow water along coasts not in the deep ocean (more than several hundred feet) so unless the whole ocean were very shallow (and I think some claim that it was, although that presents some other very perplexing problems) then that would also dramatically reduce the physical space in which these shells could have grown and died. Back to the numbers: Although this may seem like a lot of fossils remember this is only a very small deposit of shells or crinoids compared to some other places in the world. The same formation is also much much larger than the 500 X 300 square mile area I used in my calculation and for much of that area rather than 3 feet there would probably be upwards of 50 to 100 feet of fossils if they were taken out of the rocks. 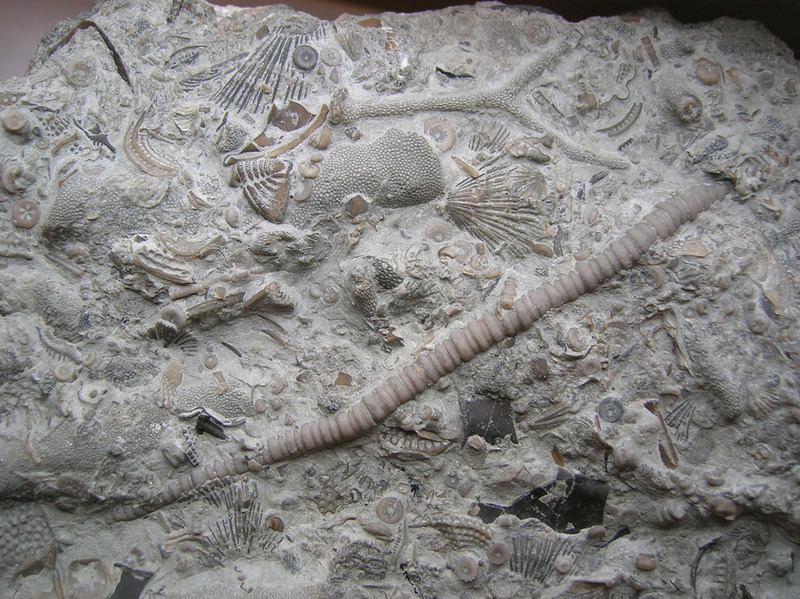 Close up for crinoids in rocks used in the construction of Sacred Heart Church in Washington D.C. The stone for this building came from Kentucky. This stone is nearly 100% fossilized crinoids and other bryozoa. Click pictures for more pictures of the stones from this building. No I haven’t actually counted all the fossils myself but neither have I estimated them based on one sample from a place that is considered a fossil graveyard. I also don’t think that the engineers that decided where to make their road cuts were purposely trying to find places were they could cut through the thickest seams of fossils just to confuse scientific creationists. The road cuts would seem to be random samples of the typical rocks that underlie this part of the country. This combined with the many cores used in looking for oil (in the layers below) etc.. give me great confidence in saying that I have undoubtedly vastly underestimated the numbers of fossils in this area. 4) We haven’t even considered the 2000-10000 feet of fossil-containing rock below the rock that makes up the lower layers of the Ohio River, we have only been talking about the top 500 feet at most. 5) Much of the rock just under the Ohio River region consists of a huge Coral reef that must have covered several thousand square miles itself and was several hundred feet think in areas. The calculations don’t even consider this mass of fossil material. Wherever this reef was before the Flood not all that many shells (the bivalve types that are in the fossil deposits) would have been living on it and so that also means that either the shells or the coral reef must have come from another place to be deposited where it is. I visited the Falls of the Ohio River state park in Indiana where you can walk out on rock that is 100% fossilized coral. As above there are thousands of feet of rock with fossils below the reef with fossils that need to be accounted for. Putting all of this together I feel confident that I have greatly underestimated the number of fossil shells from the midwest. Even if I only underestimated by 10 times that would put 150 shells on every square foot of the earth (or 400 per square foot in the oceans). Just considering the entire geological column in the Midwest alone I probably underestimated by a 100 times. Also the fossils in this entire area surely represent at a VERY MINIMUM 1/1000th of the total fossil shells in the world. Even considering that many of these organisms might have lived and died before a global flood it is hard to imagine that this many organisms living and dying in only 2000 years, much less why they would all be found in discrete layers above a coral reef. Taking the volume of fossil estimates one step further, one estimate I’ve seen of the total carbon in limestones of the earth is 6.42 x 10_22 grams. Compare this to the 3 x 10_17 grams of carbon in the entire biosphere and that is 214,000 times more living matter than is currently on earth. Even if this estimate is overestimated by 100 TIMES (THAT is a HUGE overestimate!!) then that would still put 214 TIMES as much carbon than is present in the biosphere today. Imagine how much living stuff there is and then think of their being 214 times (or 214,000 times) that much. WOW! And to top it all off we are ONLY talking about limestone here, not all the oil, diatom, and animal deposits!!!! Can the obvious implications of such numbers be any more clear? Anyone who just ignores this problem or dismisses it with wishful thinking that the numbers are wrong is not being very honest with themselves. Please go look at the deposits yourself, do some number crunching, read the actual research articles and determine if they have been fairly derived. Even if there are HUGE over-estimations involved, and I don’t think there are, they must be overestimated by a factor of several thousand in every case for this not to be a serious problem for flood geology models. If you are stunned by these numbers because you have believed a global flood was responsible for all the fossils you are probably wondering, what is the creation science response to this? The response involves talking around the problem rather than confronting it. Some possibilities will be thrown out such as; the vast numbers of fossils were the result of better growing conditions during the flood year allowing for a “bloom” of activity or maybe before the flood bivalves and crinoids grew at 100 times the rate they do today. Explanation by analogy is often used such as; just look at the dinosaurs,they grew larger and faster at some point than they could today and so might not all other things have grown more. These are possible explanations meant to sow a seed of believability but none hold any water once examined more closely. In the end, anyone that spends time actually counting up the fossils themselves, looking at how they are deposited will find themselves completely unsatisfied with the creation science models of fossil deposition. There is not the time or space here to provide alternative explanations for the origin of these fossils but I will say that there are many Christians that take scripture seriously that find the creation science take on both the scientific evidence and scriptural evidence to be in serious error. A better way to understand the relationship of science and faith can be explored in some of the books that I list on my recommended creation books page. I found this post absolutely riveting. It’s astonishing to think about the sheer amount of creatures which would have covered the face of the earth if YEC is correct that all of these died at the flood… it just doesn’t seem possible. Also wanted to note that in your last paragraph you wrote, “Even if this estimate is overestimated by 100 TIMES (THAT is a HUGE overestimate!!) then that would still put 214 TIMES as much carbon than is present in the bioshere today. Imagine how much living stuff there is and then think of there being 214 times (or 214,000 times) that much.” This is actually one thousandth, not one hundredth of the estimated number, so the shock is even greater! Nice catch there. I have made that correction. As a small addition, in all fairness, many creation scientists would not be impressed by the total carbon estimates because they would argue that most limestone has a non-organic origin. I am not unaware that some limestone/calcareous rock is not of organic origin but the total numbers are still very impressive even if a very low portion (much lower than is likely to be true) of limestone is not of organic origin.